Praise the Lord for Rain! 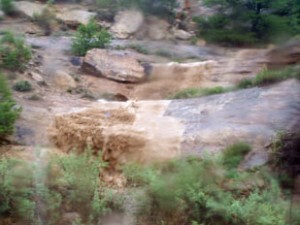 What a real blessing it is to see the rains again here in the desert of New Mexico! Although the torrential downpours have caused a bit of a maintenance headache as they wash out our roads and cause buildings to settle in odd fashion, they certainly help in cooling the summer off and greening up the land for a short time. As God is blessing with physical rain, He also blesses in spiritual ways as well. The storms of life that seem to creep up on a daily basis are part of His greater plan to prepare us here at Western Indian Ministries for whatever He has in store. We have seen Him at work as he provides more personnel to work alongside us and as He has guided toward solidifying the leadership of the mission with a new director coming on the 1st of September. We have seen Him working as we hear how Milt Shirleson recently led a young couple to the Lord in his office right here on the campus. We can see God guiding as He reveals little bits of how He is working on the bigger picture and gives us a hint to what we might be doing for Him in possibly providing a place to have classes, counseling and encouragement for people on the reservation just like this couple. I am amazed and blessed by God as He continues to use me to keep these very old, unsupported, and overworked transmitters going to continue to air the Good News on these three Radio stations. Our backyard when the rains come.